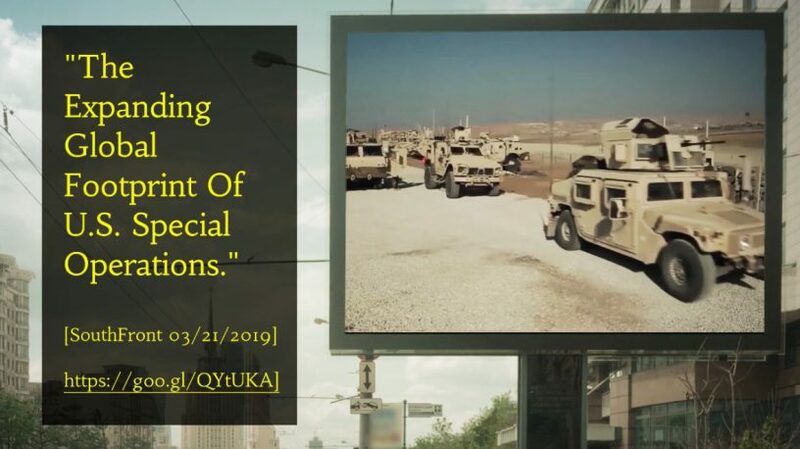 With the possible U.S. military withdrawal from Syria in the news on a daily basis, the mainstream media has been quick to parrot the DOD’s claim that 2,000 troops, mostly special operations forces, are to be withdrawn from the country. If U.S. SOF troops do pull out of Syria, they will still have a physical presence in over 70 nations on any given day. Although the public has an often vague and incomplete, unofficial explanation of the reasons behind these deployments, the Pentagon seems totally unwilling to explain the national defense rational or legality of these missions to anyone, including the U.S. Congress or the White House. Not only has SOCOM expanded in numbers, funding and weaponry since 2001 and the advent of the Global War on Terror (GWOT), but has acquired no small amount of political influence as well. Since the inception of the “Global War on Terror” shortly following September 11, 2001, U.S. SOF have more than doubled from approximately 33,000 to almost 70,000 today. Today, Special Operations Command (SOCOM) has roughly twice the personnel at its disposal, but also four times the budget as it did in 2001. Joint Special Operations Command (JSOC), comprising perhaps the most elite and specialized of the SOF forces, numbered some 1,800 in 2001. Although quite secretive in nature, it is surmised by many analysts that JSOC may have grown to the size of SOCOM circa 2001, over the same 18 year period. If realistic, this estimation means that JSOC added its original number of 1,800 men each year, for eighteen years. The Pentagon has argued that terrorism has grown, with the number of internationally recognized terrorist organizations roughly doubling from 2001 to today, mostly due to the explosion of both al Qaeda and ISIS. Regardless of the facts that point to the CIA origins of al Qaeda, there is little argument that the organization has grown in concert with U.S. military intervention in the Middle East and Africa. The same can be said for the origin and spread of ISIS. There is also ample circumstantial evidence to support the theory that the CIA and SOCOM have both directly and indirectly supported both of these terrorist organizations in Syria. Regardless of whether SOCOM is directly or indirectly complicit in aiding the Islamic terrorist organizations it declares it is defending the nation against, there is a clear correlation between the growths of both, and surely SOCOM has benefitted on many levels from this relationship. While SOCOM has maintained a sizeable presence in Afghanistan and Africa to confront a growing Chinese presence in Central Asia and Africa, it has also increased operations in the European theatre as well. In 2006 only 3% of all SOF units were deployed to nations in Europe. In a detailed analysis posted late last year, “Why the U.S. Military is Woefully Unprepared for a Major Conventional Conflict”, I outlined the causes and effects of the decline in U.S. conventional warfare capabilities. There is undoubtedly a direct correlation between the reliance upon and exponential growth of U.S. special operations forces, and the decline in conventional force readiness and capability. This is evident in all service branches and has had a negative effect on the ability of the U.S. Armed Forces to carry out future offensive and defensive combat operations against peer adversaries. Like all U.S. federal government entities, it will promote itself at the expense of all others, and will resist any demands to lessen its power and influence. President Trump has proven himself either incapable of challenging the military industrial complex, or totally complicit in the aim of that complex to perpetuate endless military conflict. The U.S. military has misallocated funds and priorities for the past two decades, engaged in misguided and disastrous regime change operations that have cost the nation trillions of dollars and thousands of lives. These military adventures have gutted the armed forces materially and morally. A generation of Americans have been left scarred physically and mentally. Hundreds of thousands of combatants and civilians in countries across the Middle East and Africa have lost their lives, while millions of refugees have fled the resultant chaos.